A rogue brace of creative spirits cuts through the couture and sweeps us straight into a sewing sweatshop in Stitch. Billed as ‘an a cappella opera for three women and three sewing machines,’ it crosses so many genres as to be in a category of its own… Imagine an opera presented outside a theatre, without a stage or orchestra. It doesn’t seem like opera at all – until you realise how much a librettist, composer and three vocalists can accomplish with the simplest of means. That’s an art. Nowhere was the creative spirit as keenly felt this past year as in some small-scale opera productions by bright young things. Each piece, in its own way, is opera for right now, and all the stronger for it. The best of the lot was Stitch, an a cappella opera that used the sights and sounds of a sewing sweatshop to tell compelling musical and personal stories. Librettist Anna Chatterton and composer Juliet Palmer were inspired… The singers, seated at their sewing machines inside a circle formed by the small audience, had to confront their listeners as well as each other on a particularly intimate scale. …imaginatively conceived by director Ruth Madoc-Jones and lighting designer Kimberly Purtell. Palmer’s music deliciously captures Chatterton’s witty text. The pièce de resistance is the Cowl Neck Blues, a hurtin’ song made up entirely of sewing vocabulary which sports such delightful phrases as “don’t hemline me”… [Stitch] is a triumph for all the artists. We won’t look at a Singer sewing machine quite the same way after Stitch… The strong opening, staged in near darkness by director Ruth Madoc-Jones in the gallery’s front room, featured the three female singers ripping fabric and humming with increasing ferocity, like soul sisters to Wagner’s Norns. 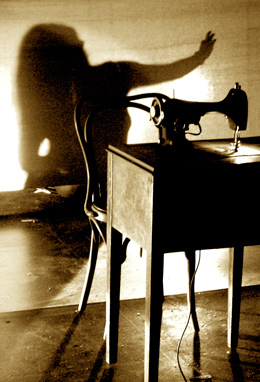 The whirs and clicks of the sewing machines provided fascinating percussion, and the singers rose to the challenges of Palmer’s range of musical styles, from lyrical three-part harmonies to raunchy blues numbers.